Elizaveta immigrated to Canada 4 years ago from Russia, right after high school when she was 17 years old. Her family is still in her home country, but her mom visits. When she came to Toronto she got accepted into George Brown College, where she chose Business Administration program. Courtesy to her wonderful professors, with whom she still keep in touch, she fell in love with marketing. She graduated from the program, specializing in marketing and decided to continue her education. Currently, she is a 45h year BBA/marketing student at Ryerson University. She really loves marketing and thinks that no business can exist and develop without it. Fortunately, everybody in CeelDeel understands the importance of marketing and every single member of the team is involved in it. They value corporate culture and our CEO frequently assigns “readings” for the team which is usually an inspiring business book written by successful entrepreneurs. Eizaveta is a shareholder of the company called CeelDeel and is very passionate about it. 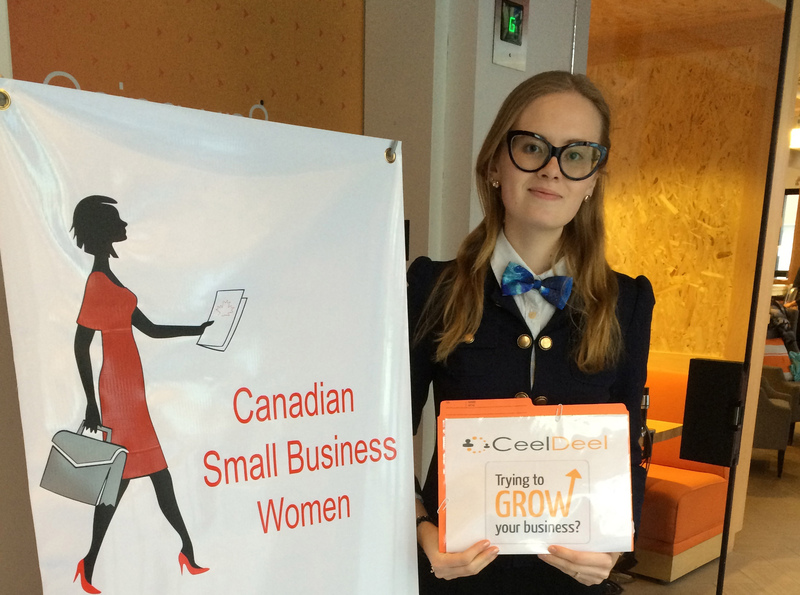 CeelDeel is a Toronto-based start up company. It is a consumer network, which helps people to find service professionals in their area. Users simply need to submit a “shout” (request for service) and all businesses at once will be contacted and be able to respond to this need. Users don’t need to search the web, just from one website to another, look through the numerous ads and all the clutter. Shouting on CeelDeel lets you make your request without wasting your valuable time by contacting them one by one. Let the businesses that are ready to help you know that you need them. Let these businesses offer you the best price and the best service. And, by the way, It is completely free for consumers! At the same time CeelDeel helps business owners to save their time and money on advertising. We know that advertising is expensive and we want business owners to say: “Good Bye!” to old, traditional marketing, such as flyers that go to trash or emails that consumers associate with spam! We offer a new, effective way to market your business, make your advertising targeted directly to those consumers, who need you! Creating a business account is absolutely FREE!When you create a business profile on CeelDeel, you will be automatically indexed by search engines and added to our platform where you can start reading the shouts that consumers are submitting and you will be able to increase your online exposure through our platform. There are different things that inspire me every day. Inspiration can be found everywhere- from your favourite music or a smile from a stranger that you met on your way to work. However above all of that, my inspiration comes from my team! I work with wonderful people, very enthusiastic professionals, who believe in our company and its success! We share our thoughts and ideas, encourage each other and celebrate happy moments of our lives! All of us think that team building is very important to develop efficiency and effectiveness in achieving a common goal.Therefore, we frequently get together to relax, forget about work-related issues and have some fun. I’m proud that I became a member of this company at the age of 20. I believe that joining this company was one of the best opportunities that I got in this life so far, and I’m very happy that I was brave enough to take it. I know that I will do everything possible (and I believe that “If you can dream it, you can do it!”) to make this company successful, because I see how hard everybody in my team is working and I want all of us to get rewarded. The best advice I can give to other small business women is to be brave, be focused on what you are doing (don’t just jump at every opportunity that comes across), do what you love (it’s your business, better fall in love with it! ), know what you do (every aspect of your business!) AND NEVER EVER be afraid to ask for advice if you don’t know something! We are anticipating to launch our website in the next month (currently we are only subscribing customers and businesses to our temporarily website in order to make sure that there are enough people interested in our business idea). We are now in the last stage of development, trying to make sure that there are no bugs, issues or mistakes that can frustrated our users. It takes a lot of time and effort, since our website has a smart program that automatically understands consumer’s wants and needs in any way they decide to phrase them. Therefore, our biggest upcoming milestone is the launch of an actual website. After that, we hope to expand our business further into Canada and let people from outside of Toronto to enjoy the benefits of CeelDeel.